What could be a better & thrilling experience then falling in love at first sight, I guess nothing. That is what happened to me as soon as I crossed the security check and entered the Ranthambore National Park. I had visited the Ranthambore National Park alongwith my Wife and 3 Year Old Son during the month of October in the Year 2015. 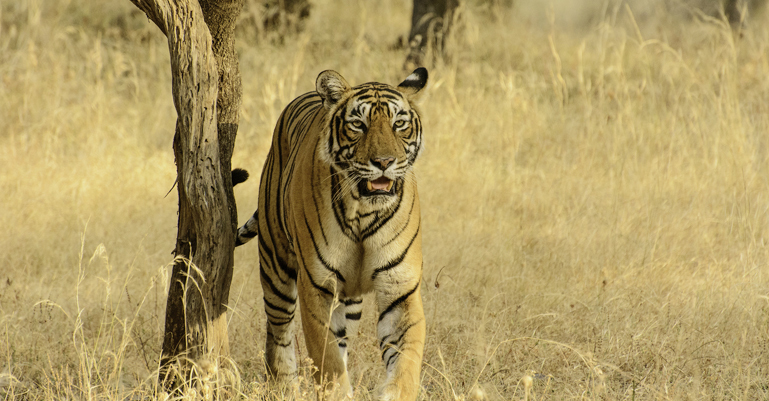 We were there for four nights in all and we took 5 Safaris and saw 6 different tigers including the Legendary Queen of Ranthambore, Machli. 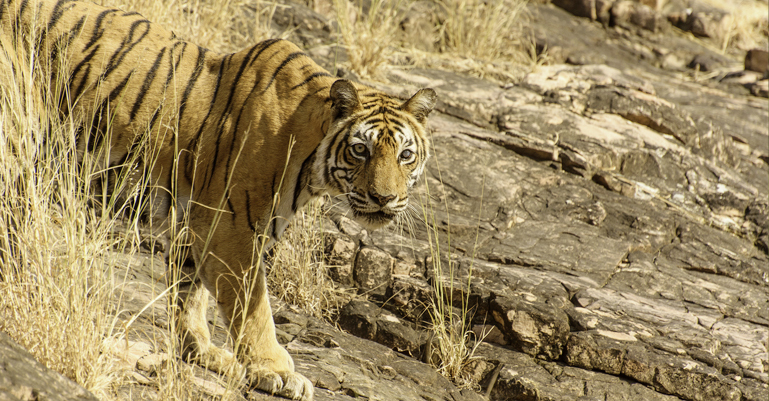 Rich in Heritage as well as the Wildlife, Ranthambore National Park is truly mesmerizing. Every zone which we visited was different in its own way. We were truly mesmerized by Zone 3 which is as beautiful as it can be. 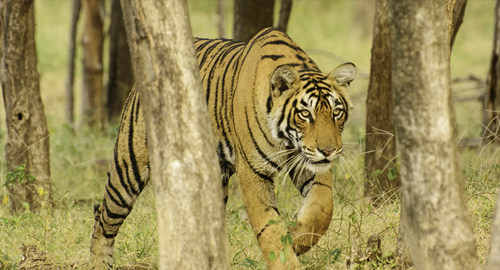 With ample water and flora and fauna Zone 3 is a Tiger’s paradise. I would love to mention that during our visit we were able to witness three generations of a Tiger i.e. Machli, Krishna and Arrowhead. Seeing them all in just one visit to Ranthambore National Park was sheer luck and I can rightfully say that we were truly blessed by Lord Ganesha himself for such wonderful sightings in a land which can be rightfully called the Abode of Lord Ganesha. I still remember that as soon as we entered the jungle on our first safari in Zone 4, we saw Machli coming towards us and then disappearing in the bushes but coming out again when we were about to exit. This time she was with us for almost 30 minutes when she gracefully walked out of the forest and came on the Ganesha Temple Road. It was wonderful driving almost parallel to her and at one point of time we were facing her directly when she came out of the bushes and moved head on towards our Safari Vehicle. The next day as soon as we entered Zone 3, we heard a few alert calls and coming towards us were Krishna and her Male Cub. Again they graced us with their presence for almost One Hour. 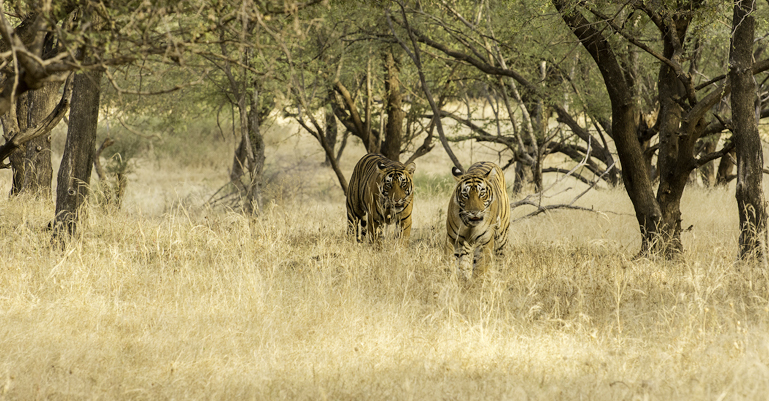 A couple of Tigers walking together with us was a dream come true for me as I had never witnessed two tigers together before. I couldn’t have asked for more but our visit to Lord Ganesha that same evening made him really happy I suppose and he saved the best for us for our last day at Ranthambore. Before I move on to my thrilling experience of the last day at Ranthambore I must not forget to mention the great Ranthambore Fort as well as the Temple of Lord Ganesha that dwells withing the fort. If in Ranthambore it is a must visit place and one should always seek the blessings of Lord Ganesha for a better life. 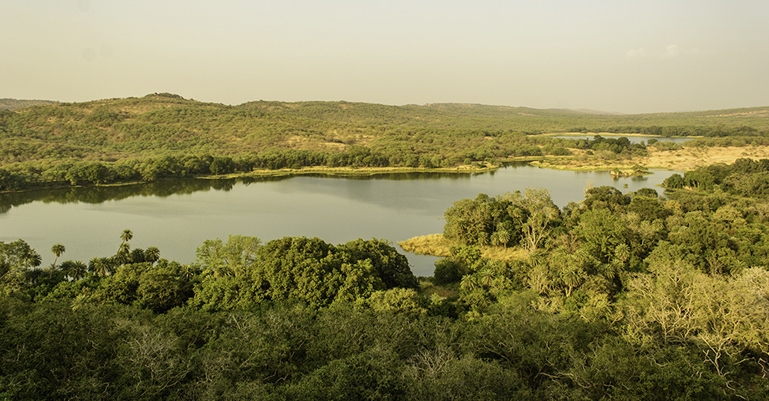 The view of the Jungle from the top of the Ranthambore Fort was truly captivating. The temple itself is mystifying as it is said the idol emerged from the rocks on its own and is the only idol of Lord Ganesha which has three eyes and is rightfully called the Trinetra Ganesha. So with his blessings we started our third day of the Safari with Zone 5 and it was not at all disappointing as I just loved the serenity at the end of Zone 5 where a small stream flows and it is almost covered with trees. 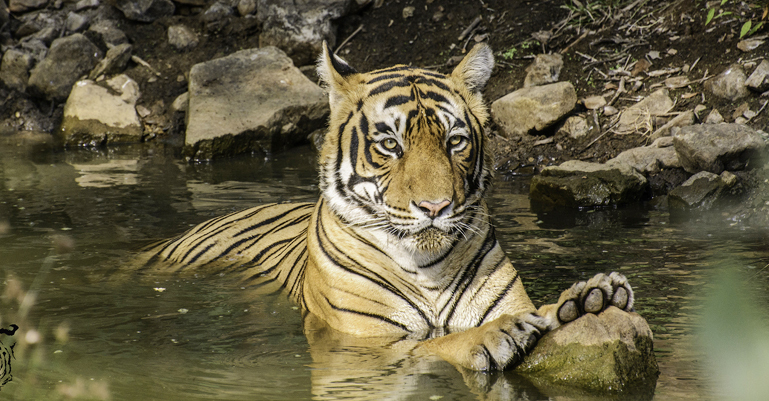 Just before we were about to exit Zone 5 we saw Akash, the previous litter of Krishna, gracefully sitting and beating the heat in a Pond. It was lovely seeing him there dipping in the water when due to a false alert call he just got up and disappeared into the jungle. As I said that Lord Ganesha had saved the best for us for our last day, in the evening we went to Zone 3 and after a few minutes we reached the boundary of Zone 3 and Zone 4 and in front of us was Arrowhead lying down. She was there relaxing and took her time to get up after which she moved down towards Zone 3 where she stalked a wild boar. After stalking the wild boar for almost 15 minutes she ran towards it and what a pleasure it was seeing her running and leaping all over. It was such a thrilling experience watching her chase a wild boar as it was for the first time that we had seen a tiger chasing down another animal. Previously we had only seen such an event on television and experiencing it live was another dream came true. I wish I could have stayed at Ranthambore for more but as I had my family with me I had to continue with my onward journey but a few things happened in my life after my visit to Ranthambore National Park that just makes me feel happy and ecstatic. 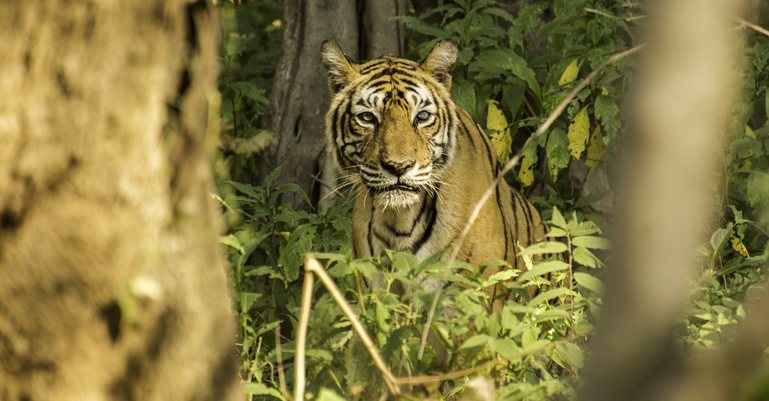 Firstly my wife Sandhya who always told me that you have seen enough of jungles now wants me to plan another holiday to jungles as she too felt in love with the Tigers after seeing them for the first time in the jungle. Secondly one of my Photographs of Arrowhead while she was stalking the wild boar got featured in an online magazine which is published from the United Kingdom. It won the second prize for the Photo of the Month Section. Thirdly and so far the best thing which makes me happy after visiting the Ranthambore National Park is that my 3 Years old son Vivaan who was with me all the time in this wonderful trip to Ranthambore recognizes Machli and Arrowhead and every time he tells me their names after seeing them in the Photographs taken by me I just feel so proud and out of the world for Nurturing another Nature and Wildlife lover.